Do you ever look at someone and wonder what’s going on inside their head? Disney-Pixar’s “Inside Out” takes an exciting and hilarious journey into the mind to find the answer. Based in Headquarters, the control center of 11-year-old Riley’s mind, five emotions are hard at work, led by lighthearted optimist Joy. She strives to make sure Riley stays happy as she operates alongside fellow emotions Fear, Anger,Disgust and Sadness. It's not uncommon that we all go through lots of emotions throughout the day. What I love about the movie Inside Out is how much they captured what our kids go through, but also captured adults too. This was such a great movie that my family and I got to enjoy for our movie night. We had been wanting to see it for a while, so I was pretty pumped when we got the chance to watch it. The main character is Riley and her emotions, Joy, Sadness, Disgust, Fear and Anger. These five emotions go through a lot to make sure Riley is happy. So when she gets the news that she's moving to a different state, the emotions try their hardest to make sure Riley doesn't feel sad, but the emotion Sadness starts touching the memories made from Riley's past, which sends both Joy and Sadness to an adventure outside of headquarters that leaves Disgust, Fear and Anger in charge of how Riley starts to feel on her first day at a new school. Through this adventure Joy realizes that Sadness is an emotion that is okay to have and that you need it in order for you to grieve things left behind or lost so that you can start to make new memories where you're at. I have to say towards the end of the movie, it definitely had both myself and my daughter tearing up. This is such a great movie that the entire family should watch together. Definitely one to add as a gift this Christmas for your family to open and enjoy together. 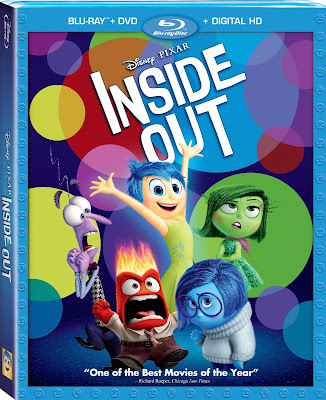 Inside Out is now available on both DVD and Blu-ray in stores. Be sure to make this a movie you watch with the entire family, you won't be disappointed.